Sponsored by ACM SIGMicro and IBM. Virtual machines are used in a number of computer science and engineering disciplines to provide a flexible, "intelligent" interface between software and underlying hardware. Consequently, virtualizing technologies can enhance future computer systems in a number of ways, including improved security, interoperability, and portability. This talk will survey the variety of virtual machine architectures and applications and then focus on three potentially important future applications: security, grid computing, and portable environments. The BlueGene/L supercomputer has been designed with a focus on power/performance efficiency to achieve high application performance under the thermal constraints of common data centers. To achieve this goal, emphasis was put on system solutions to engineer a power-efficient system. This talk will give an overview of the unique challenges which faced the BlueGene team, and the innovative system design solutions which optimized across the design space ranging from packaging to system software. Finally, this talk will examine the power and performance efficiency of applications on the BlueGene system. Attention all speakers: There will be a laptop with PowerPoint and Adobe Acrobat reader and a projector available for presentations. There will also be an overhead projector for transparencies. Available in HTML or in PDF format. 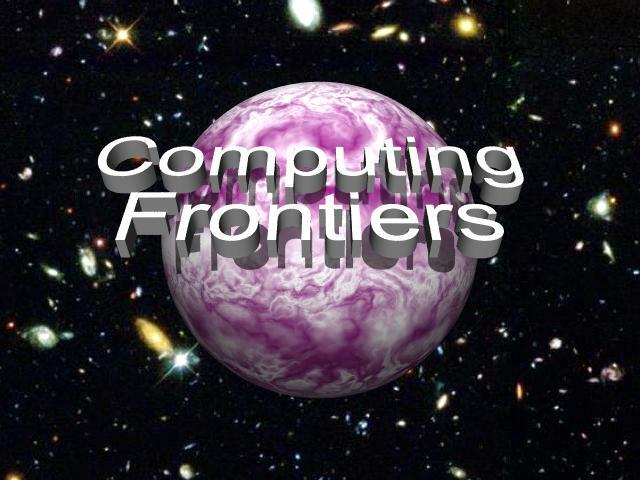 The increasing needs of present and future computation-intensive applications have stimulated research in new and innovative approaches to the design and implementation of high-performance computing systems. This challenging boundary between state of the art and innovation constitutes the computing frontiers, which needs to push forward and provide the computational support required for the advancement of all science domains and applications. This conference will focus on a wide spectrum of advanced technologies and radically new solutions and is designed to foster communication between the various scientific areas and disciplines involved. Authors are invited to submit papers on all areas of innovative computing systems which extend the current frontiers of computer science and engineering and that will provide advanced systems for current and future applications. Full papers should be submitted through the Conference Submission Page. Papers should be no longer than 6000 words, single-column and double-spaced, and in PDF format (printable with Acrobat Reader). PAPER SUBMISSION DEADLINE IS DECEMBER 20, 2004. Acceptance/rejection will be emailed by January 24, 2005. The final manuscript will due February 23, 2005. Submission implies that at least one author will register at the conference and present the paper. Special session on Reversible Computing The session will compromise the 1st Intl. Workshop on Reversible Computing. The conference is planned for May 4-6, 2005 on the island of Ischia, Italy. How to get to Ischia. Tourism information about Ischia. Please use this Hotel reservation form. March 1st, 2005: The conference program has been updated to show social events: Welcome reception (May 3, 19:00), and Conference Banquet (May 5, 20:00). Feb 17th, 2005: The CF'05 conference program is now available. Feb 14th, 2005: Camera-ready papers are due on Feb 23rd, two more days than initially announced. Hotel reservation form is available. Conference registration form is available in PDF and MS Word format. Oct 18th, 2004: The Computational Biology track has been dropped fom the conference. If you were interested in submitting to this track, please submit to the Open topics track. Oct 25th, 2004: The venue will be the Hotel Continental Terme once again. Updated rates are available. Nov 23rd, 2004: Added a link to the Special Session on Reversible Computing. Dec 1st, 2004: Paper submission deadline has been extended to Dec 20th. Please note this is a sharp deadline: no further extensions will be granted. Author notification has been delayed by a week to provide time to the reviewers. If you have any further questions, please contact osantana@ac.upc.es.